With common core we are expected to incorporate more writing, technology, and high-order thinking. 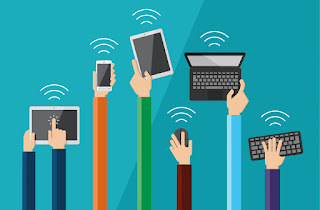 I know that lots of classrooms do not 1:1 with computer, so the questions becomes how are we suppose to incorporate technology. I attended an webinar that demonstrated a low tech twitter wall. 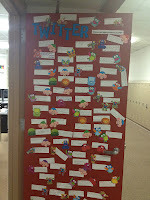 I thought what a great way to demonstrate that any classroom can incorporate this type of social media into their classroom. My students where given a question; What are you looking forward to at LMS? They where instructed that they needed to start their response with @LMS since they were replying to LMS. They were instructed that they must write a complete and proper sentence. We talked about what a complete and proper sentence looked like. We even solved a math problem. In Twitter you are only allowed 140 characters. We talked about what are characters. The math problem: If you have to start your Twitter response with @LMS and you are only allowed 140 characters how many do you have left to write your response? 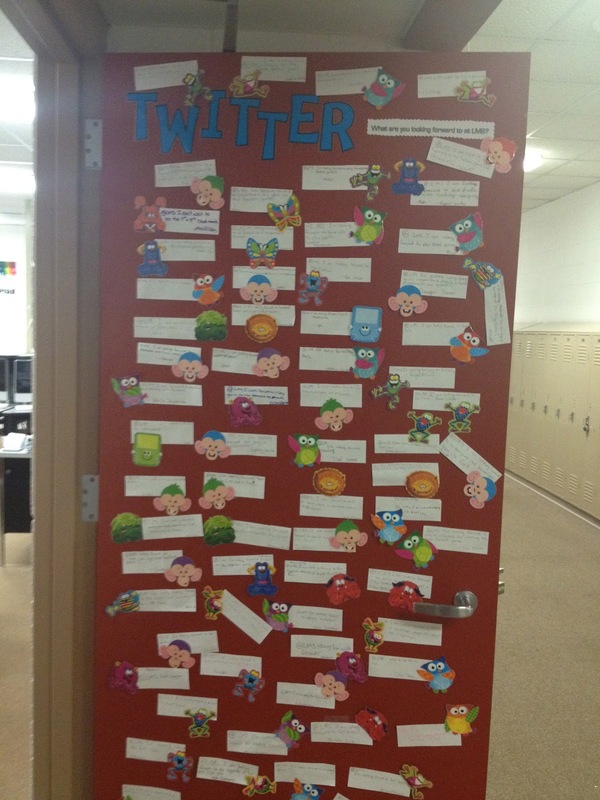 We practice writing our responses then each student picked out their avatar and our Twitter door came to life. I used the mini bulletin board cutouts for our avatars. We have little monsters, crazy frogs, wacky monkeys, ipods, butterflies, and owls. They kids had fun picking out their avatars and started planning making plans on who we should do our next Twitter response. Before I forget I have the winners of the Socks Rhyming Game.